35 ways to get in shape! My 35 ways to get in shape is 35 DAYS!! Yes – that’s it!! Did you think I had a list of 35 different ways to help get you in shape? Nope. Just take 35 consecutive days, WORK IT, and get in shape! Then just keep going! Today was Day 35 of my 47 day challenge, and even though my speed and endurance is surpassingly better than they were on day one, I do have a bad day every now and then! Today I started running and my legs were not feeling the love! They wanted to stay at home I guess! So even though I had that sluggish feeling to begin with, I didn’t give it a second thought! I kept on going and still did an 8 minute mile! That’s just amazing to me! On my slow day I can do an 8 minute mile! I LOVE the sound of that!! Yes, I’ve come a long way, but I’m not stopping anytime soon. There’s no reason to. I’m not interested in putting myself first only for 47 days to fulfill my challenge. This is a lifetime change and commitment and it all started with changing my outlook on life and on myself. I had to find ‘Mary’ again which wasn’t too easy to do! With the helping HAND OF GOD and lots of diligent work, I was able to change my entire way of thinking! I regained control over my life; GOD is 1st in control and I’m 2nd, no one else! Once I embraced this change, I was able to successfully transform my eating habits and I have become a better person all around – healthier, happier and STRONGER! When people are curious and ask me about my life then I LOVE sharing my stories! There have been hard times and good times, successful and not so successful times! I love to share my very own life’s story with the world! I think most people are like this don’t you? We all love to share happy, successful stories & testimonies with others! I’m not the kind of person that intentionally ‘pushes’ my views on others! If I can make a difference in someone’s life, then GREAT! But it’s up to you and only you to make change in your life happen! Hold true to your beliefs and don’t let anyone or anything hinder that for you! Everyone should do what ‘they’ believe in, and never do things for the sole purpose of making ‘others’ happy. It won’t work out in the end this way. You need to do things for YOURSELF! Bottom line is… we all need to make a stand, find our passion and stick to it! I’ve always said it’s better to be HOT or COLD then to be luke warm, by the way… the Bible also says this!! Say what you mean, and mean what you say. Don’t waiver. The way I look at it, we’re all accountable for our own lives and that’s about it. If you’re a parent, then you are responsible for the lives of your children up until a certain age, and then you must let go, and they in turn become accountable for their own lives and actions. We all are responsible for our own relationships in life as well. Others cannot make relationships work for you. Relationships and accountability are based on honesty. It’s hard to maintain a relationship if there is no trust and certainly no honesty! Part time honesty doesn’t work. In order to be accountable for your own actions and responsible for your own relationships, you must have integrity. How can one be honest with others if they can’t be honest with themselves? It’s not going to happen! To make commitments and promises and not keep them is a form of dishonesty. There is no honor this behavior! As we go thru life day to day, we have to be diligent in making sure we live a life of honesty. Have your circle of friends… apply trust & honesty, and close the loop! There’s no other way. Today is day 34 of my 47 day Challenge! It’s great to have one more run successfully completed!! 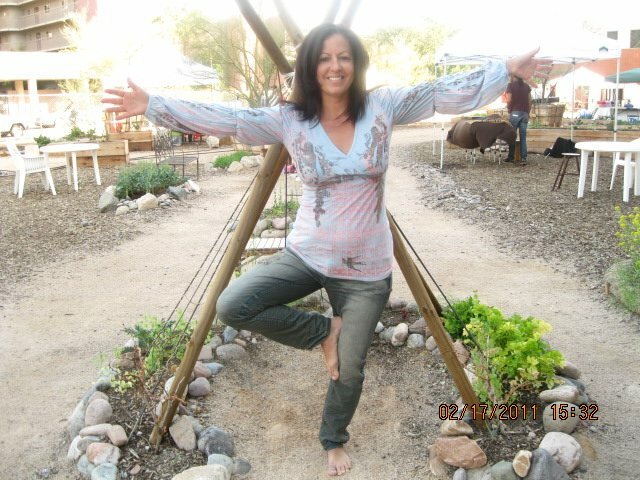 I am honoring my challenge and most of all staying true to myself! It begins with ME! I wish you all success and relationships in life that bring you fulfillment! Always remember that honesty is the best policy, or else you risk LOSING much! Is it worth it? >Yesterday FLEW by! Sunday, May 29, 2011, Memorial Day weekend! There was so much to do that I seriously don’t know how I did it all. Of course 1st on the list was to get that mile run in!!! And WE DID!! Lee and I both took off running and completed our mile in no time, and actually squeezed in a small workout… but then it was on to other things. Holidays are a great time to spend with the family! And that’s just what we did! It was a day of backyard fun! And the best thing for me is… the next morning when I wake up I don’t beat myself up and say things like “why did I eat all that?! My diet STARTS tomorrow!” Nope, you won’t hear me saying that anymore… because I have no regrets with what I eat! 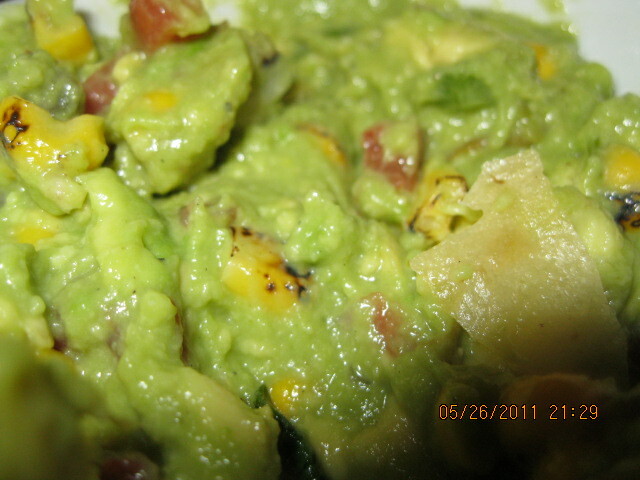 My plate consisted of Mediterranean salad, rice, beans, fresh guacamole and lots of WATER….water water water! Living gluten free vegan is the way to go! I’m not clogging these arteries and slowing my body down anymore! I’m feeding it only what it deserves! The very best! For those of you celebrating Memorial Day today, I hope you have a wonderful time! Stay cool & safe! Here’s to all our soldiers who have left us! My heartfelt thanks goes out to them and their service! Their memory will live on forever! My love to all their families!! GOD bless the USA! May all our troops get home safe! >2,764,800 Seconds; 46,080 Minutes; 768 Hours, or Simply 32 Days! Posted by marysparacino in 127 Hours, Day 32 of challenge; The Journey from Success to Significance, JUST DO IT, the movie. 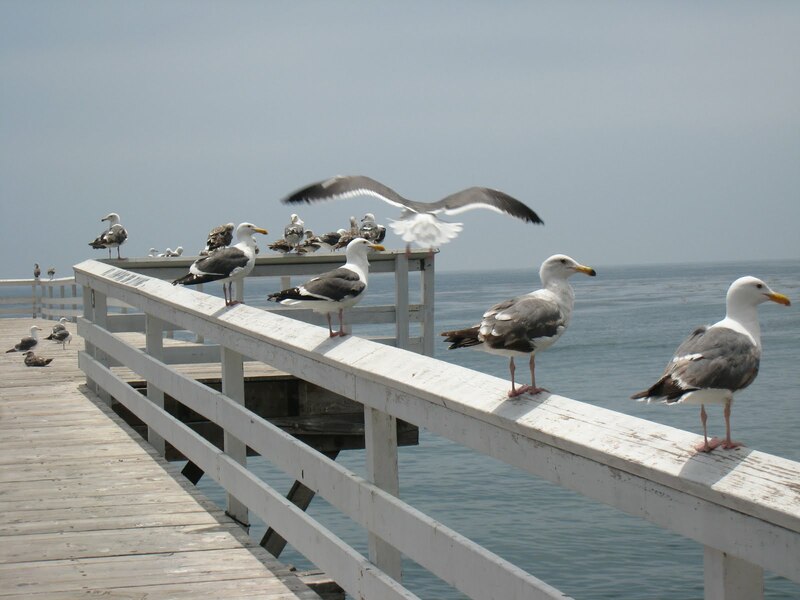 Malibu Beach. >However you prefer to look at it, today is day 32 of my 47 day challenge!! To spice up my run today, I chose to run on an incline, level 3, and let me tell you… I’ve never ran in mud, but I suspect this is how it feels! My legs at one point were so heavy I could barely go on! Talk about raising your heart beat! My body was sweating from glands I didn’t know I had! I LOVE TRYING NEW THINGS!! I was feeling rather inspired this morning, after watching the movie “127 Hours” last night. I figured why run flat and straight every day? I mean, sure running is hard – period, but c’mon, may as well kick it up a notch every now and then! So although I was not running at a high speed, I found it quite invigorating, and there’s no doubt I burnt more fat with this run! It was a great mile run, a little more difficult than I’ve been doing, but again… what a feeling of success! Another day that I’ve proven to myself I can do it! The world’s not going to tell me I can…so why wait? Take control of your life and DO IT! JUST DO IT!! what a great place to meditate and figure things out! If you haven’t seen the movie 127 Hours, do yourself and favor and watch it! This movie has so many messages in it! For me, it reaffirmed everything I already believe. GOD and only GOD is in control, and events happen in HIS time and HIS WAY. God doesn’t only have our lives planned, but he has every split second of them planned! We go about our days mainly focused on our own lives, and seldom observe what’s going on around us. Perhaps if we were move involved in other people’s lives, helping out when and how we can, then our problems wouldn’t seem so big. So if your life feels like it’s running in mud, it probably is. Press on… and turn that mud into water so you can move faster! Water it down and thin it out by helping others! Life is great…it’s not bad, you just need to change the way you’re doing things! Start changing things today by living a gluten free vegan life! >I want To Hear From You! >Greetings from the Sunny Southwest… PHOENIX, ARIZONA! Mary here just to tell you how exciting it’s been to get this blog up and running, along with my twitter account! I’ve been working diligently on my book, and now it’s finally ready to go to editor/publisher! Yahoo! When I look back over this past year, and see all that’s transpired, I find it all so exhilarating! I have had a passion to draw and write since I was just a little girl! I have some very early memories of drawing special pictures for my dad – I’m sure at the age of 5, my drawings must have seemed like scribble, but when I showed him what I had drawn, he would go on and on about them! He had a tender way, as only daddies do, of making me feel special! Countless times my writings would bring tears to my mother’s eyes! She has always LOVED my poetry, which I have written since I was a young girl as well! So many of them have gotten away from me, and I so regret not keeping better track of them! I’ve had one poem and one story published. Most of my other poetry I have given away as gifts to people near and dear to me as a token of my love! 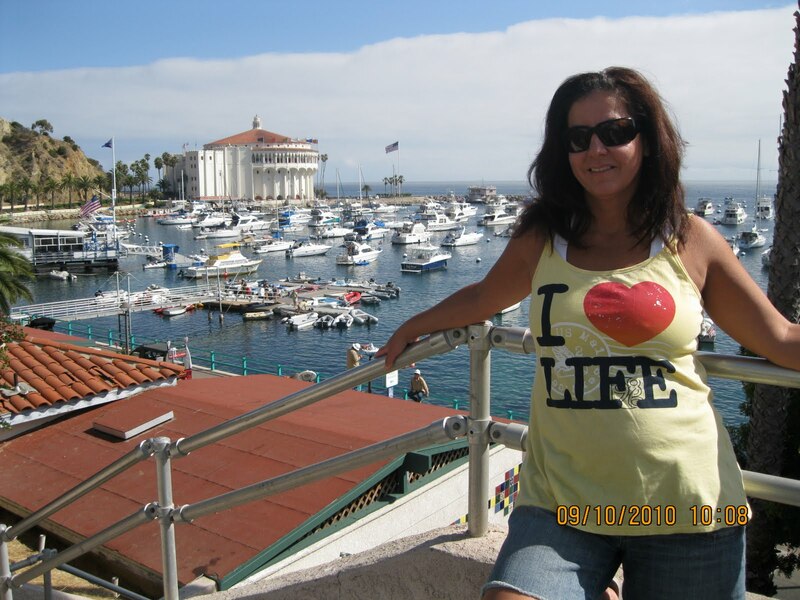 Me at Catalina Island! I can’t wait to go back! So with a sense of pride that my parents instilled in me, I pursue my writing and hope that you can be inspired by it. I look forward to responses from ‘you’, my readers and followers, and hope that you also enjoy my writings and soon to be released book! With today’s technology, there are many options and venues to get my communiqué to you! I have chosen Google’s blogger for my blog, @blogspot.com, however, there seems to be many issues with the site. I’ve lost my list of followers and there appears to be problems with comments being posted. Many people have told me that they attempt to leave a comment and find it very user unfriendly. If you don’t have a certain type of account then you must create one or else you are unable to leave a comment. I apologize for this! If anyone has suggestions for a more reliable and user friendly blog, please let me know. For now, I would like to give you my direct email address and hope that you make note of it, and PLEASE send me feedback! Your feedback is my daily inspiration! Please feel free to email me directly at: ml@livingglutenfreevegan.co. Stay close and please keep coming back. I hope you enjoy my blogs, and again, I look forward to getting my book out very soon! >Friday, May 27, 2011, day 31 of my challenge, going into Memorial Day weekend!! Yeah Baby!! Summer’s on, and it’s HOT!! What better to start it off than to get up early, eat a bowl of oatmeal loaded with some fresh fruit, and on to the gym for a run and a workout!! The countdown is on; the finish line is so close it’s unbelievable…16 more days!!! SWEET SIXTEEN!! Then I can say 47 days came and went and I had something to say about it, with Lee by my side the entire challenge! We’ll have maximized that time and made ourselves better and stronger – in all ways. No guilt, no regrets, just a feeling of proud accomplishment! Oh no…. am I counting my chickens before they hatch? I don’t think so!! Lee & I will both meet this challenge! Be positive, it’s OK! Success is all around!! My dreams of publishing a book are coming to fruition!! I’m so happy and excited about it! I want to share it with the world!!! Again… wish me luck!! Fresh beets are on the menu for later today! 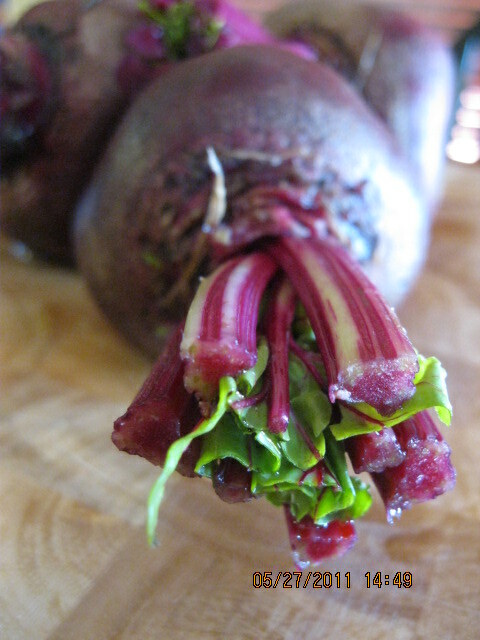 And the greens that are part of the beet are edible I hope you know!! 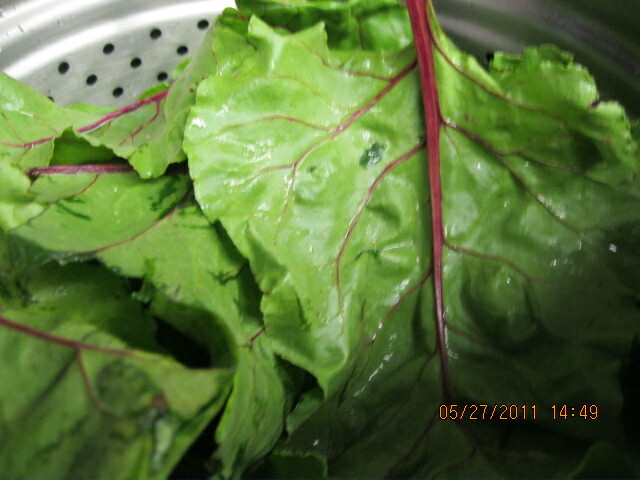 Steam them both… the beet and the green, and then ENJOY!! Mmm Mmm !!! >Crossing Over To The Other Side! >Speaking solely of ‘FOOD’…. have you crossed over? I have!! And man ol’ man is it a relief! 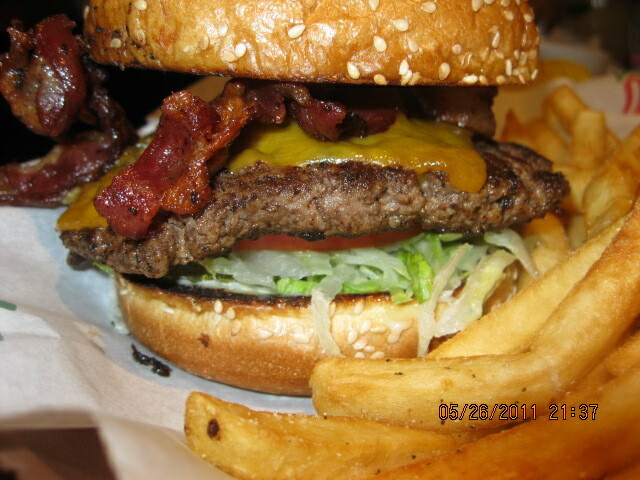 Long gone are the days when bacon burgers make my mouth water! I look at one of these now and it literally makes my skin crawl!! Trust me, I’m not judging those who choose to eat this… really, I’m only speaking of myself and how I look at it! I totally respect individuality! We are all responsible for our own lives, and that’s it! But see, I’ve been at my worst in terms of my mental and physical condition. I’m talking about lethargy, mood swings, belly aches, migraines, acne… you name it! I had to pull myself up with the last ounce of energy I had, shake myself off, and retrain myself! Now I am HAPPY and I FEEL SO MUCH BETTER! I’m a new me! All my ailments are GONE! So, I can finally say… I’ve crossed over! Don’t ever feel bad if we’re sitting at a table eating dinner together and you are eating a bacon burger and I’m eating a salad! I’m happy! No need to feel bad. Give me my gluten free vegan food and I couldn’t ask for me! On this long holiday weekend I wish you fun, happiness and safety! God Bless us all, and God bless the USA! >Power Breakfast It Today, On Gluten Free Vegan Food! >Oh my! Am I dreaming or what? Someone pinch me! My record run time so far this 47 day challenge has been 9 minutes and something! I don’t remember without looking back through these blogs… but I have never run an 8 minute mile for sure! Well today, day 31 of my challenge, perhaps due to my AWESOME breakfast consisting of a banana shake, followed ½ hr later by some corn and soyrizo, I ran a 7 min & 58 second mile!! WOW WOW WOW!! My thighs were burning baby!! I was on FIRE!! At one point, I wasn’t sure if I could keep going but I just kept envisioning my fat burning at a high rate… that’s all it took! Ok… so lesson in today’s run? DON’T be afraid of a little pain! Don’t let the burn stop you! Excuses… I rebuke you!! DAY 30!!! It truly is amazing that Lee and I both have run a mile a day, sometimes more, for 30 consecutive days!! Bravo! Some may chuckle and think it’s rather peculiar that we would celebrate this small success, but for us it’s much more! What’s small for some is big for others, and vice-versa!! And of course you know the ol’ saying “one person’s trash is another person’s treasure.” The bottom line here is …it’s all about PERCEPTION, but not necessarily the perception of others, but your very own perception! I think we get it backward sometimes wherein we care more about how others see us and what they think about us, when in reality it’s more important how we see and feel about ourselves. I’d like to share a little personal story with you on the topic of “Perception.” There was a time in my life when my children and I worked with homeless people. We participated with a small group of others to cook and feed the homeless once a month and provide them with things such as clothing, sleeping bags, toiletries and so on. You can imagine how the homeless looked forward to this, but what I bet you can’t fathom is how much I looked forward to it. They got fed physically, I got fed spiritually. So on with the story! While feeding the homeless, my family and I were fortunate to meet many wonderful people! They all had their own stories; it was quite fascinating to say the least. There was this one homeless man named Michael who I became very close friends with. I invited him into our home numerous times to shower, sleep, and have meals. My children welcomed him like a family member. Michael was fun and had a lot to say! He told interesting stories, and many times he would bring gifts with him, mostly books. We always LOVED the books he would bring! I do not lie when I say I learned many things from Michael! His heart was overflowing with love and kindness. Baby hummingbirds waiting for their mom to get home with food. 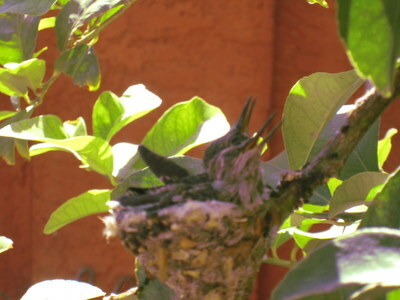 This is a picture I took of a nest that was in our backyard lemon tree! They ask for nothing and are simply happy with what they are fed! This really choked me up. He perceived me and my family as ‘KINGS.’ Michael was a homeless man who basically had no worldly goods other than a bicycle, some blankets, a handful of clothes, and a few miscellaneous items. No wonder he saw us as kings. When we compare ourselves to people greater than ourselves, we may not see ourselves as KINGS, but if we open our eyes to just how big and great we really are, without comparison, then we too can perceive ourselves as KINGS! We all need to look at ourselves the way Michael looked at my family, he saw our many blessings and perhaps the things we take for granted on a daily basis! No matter how big or how small your accomplishments are in life, they are BIG and GREAT when you perceive them that way! Don’t cheat yourself! We ALL are kings and must remember to thank GOD each and every day for all that we have. Believe it or not, eating gluten free vegan is humbling. You learn to eat to live instead of living to eat! Michael’s words were a humbling experience to me, and I must say that we could all use an ounce or two of humility! Would you agree? 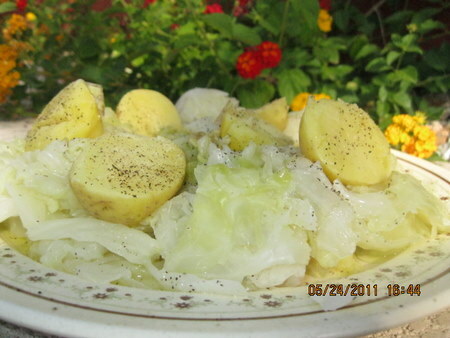 >Cabbage , as with just about everything else from Mother Nature, offers us a plethora of health benefits not to mention the deliciousness of it! Don’t wait till St. Patrick’s Day to eat it!! If it’s folic acid you’re after, then cabbage is the answer! Calling all pregnant women… listen up! Folic acid is especially good and recommended for giving birth to a healthy beautiful baby! Eat and reap its awesome blessings! Thank you once again Mother Nature!